One of the crowd pleasing aircraft displays at the Australian International Airshow at Avalon in Victoria is the RAAF F/A-18F Super Hornet. It also provides critical advice on the technical risks and readiness for the acquisition of such platforms. The scientific expertise in the division includes propulsion systems, aircraft structures, flight dynamics, advanced aircraft materials, human factors, simulation and hypersonics. 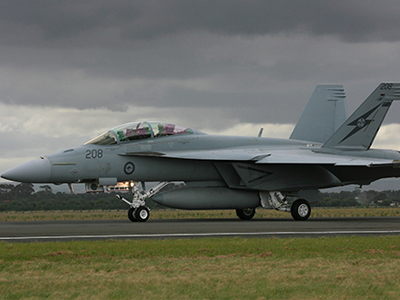 Aerospace Division supports every aspect of the operation and maintenance of Australia’s air combat fleet, including the airframes and engines, weapons and stores, electronic warfare, signature management and platform information systems. Through the division, DST Group continues to be a world leader in the key area of structural life management, which ensures the longevity and maximum performance of aircraft. In 2002, DST was awarded the prestigious Von Karman Award by the International Council of Aeronautical Sciences (ICAS) for its structural fatigue test of the F/A-18 Hornet aircraft. The Von Karman Award was again presented in 2012 for international collaboration in hypersonics research. Evaluation of future concepts, including investigations into replacement options for ageing platforms, evaluations of future warfare requirements, including Unmanned Aerial Vehicles (UAVs), assessments of different force-mix options and analyses of whole-of-life cost issues. Analysis of technical risk associated with specific technologies or particular aircraft designs and recommendations on measures to mitigate the risk. Experimentation, through laboratory testing or simulation to test and analyse emerging systems and operational concepts. Development and testing of new aerospace capabilities, such as high speed flight and unmanned aerial systems. Development of techniques to assess damage and defects in aircraft structures and engines; and techniques to repair them. Forensic examination of aircraft components after accident or incident with a view to understanding the mode of failure and means to repair or prevent repeat occurrences. Support to operational flying safety by assessing environmental issues which may affect the safety or well-being of air crew.